"Great side dish. French lentils (also called puy lentils) have a wonderful earthy flavor. You can't substitute regular green/brown lentils. They are expensive but usually affordable at your local food co-op. Goat cheese has a creamier texture than feta. I like to add grape tomatoes." Combine sherry vinegar, 3 tablespoons olive oil, and minced garlic in a jar with a lid and shake until blended. Set aside. Place lentils, chicken broth, water, and 1 tablespoon olive oil in a saucepan and bring to a boil. Reduce the heat to low and simmer, covered, until the lentils are just tender to the bite, about 20 minutes. Do not overcook. Remove from heat, drain, and cool for at least 30 minutes. Transfer cooled lentils to a mixing bowl. Stir in the dressing, chives, and cilantro; mix well. If you're serving the salad immediately, add the goat cheese and tomatoes. If you're preparing the recipe ahead of time, refrigerate the salad and add the goat cheese and tomatoes just before serving. Taste a creamy, inspired version of the classic tomato salad. You may substitute balsamic vinegar, vegetable stock, and feta cheese for the sherry vinegar, chicken stock, and goat cheese, if you prefer. 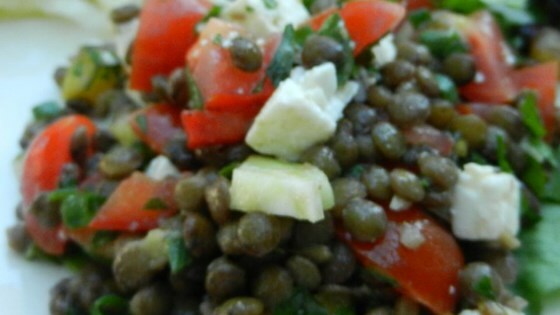 I followed this recipe exactly, i did really like the french lentils.I did not like the flavor. I have used sherry vinegar before but I think this recipe could use something warmer in flavor. I used 2TB of olive oil, and tried the feta and balsamic option. The whole family loved it. Delicious and easy. So easy to make and delicious!! I am no cook and I pulled this off with my man (who can cook) and it was a huge success. New family favorite now! Great flavors! I added red onions instead of chives and white basalmic vinegar instead of sherry vinegar. I loved this recipe. I made it as written and my husband ate all the leftovers while I was at work the next day! I will definitely be making this again. Thanks for a new side dish!